Madras (Chennai) – as is it aptly referred to as – ‘The Cultural Capital of India’, is a beautiful place to see the cultural flavor in its every essence. And the most important example of this is the Festivities of Margazhi (Mid December to Mid January) Month. Margazhi month has a very long list of ways of depicting itself. I remember the beautiful little streets filled with huuuuuuge Kolams and my effort to bicycle in those streets with great care and almost breaking the hand bar to take several twists and turns, so that I do not mess with those exquisite pieces of everyday art. Suburbs of Madras always has its uniqueness and specialty. The beautiful Kolams are further enhanced with the cowdung cake and pumpkin flowers at the centre. These cowdung cakes are thrown on the roof and are collected back at the end of Margazhi month. The essence of this practice is savings i.e., to save the cowdung cakes for fuel. Getting up early in the morning with the music of Thiruppavai and Thiruvembavai is so soul pleasing. It’s a perfect day to start a day. Tamizhians all over the world gather in Madras for the Music Festival which happens right from Music Academy and Narada Gana Sabha, to every park and hall throughout the month everyday for the wholeday. Another specialty is the Mylapore Festival, near Kapaleeshwarar Koil. It’s always a major 4 day event for those with an eye for cultural beauty. 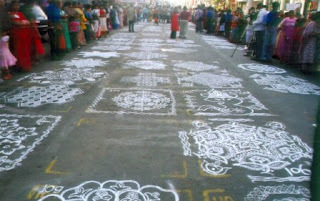 The major event of Mylapore Festival is indeed the Kolam Festival. I love it. With women all over Madras, right from professionals (I mean, those who draw detailed Kolams everyday at home) to amateurs (~Ahem, those draw Kolams only on Festival days, like me... J), trying their hand in Kolams and trying their effort and luck to win a prize. 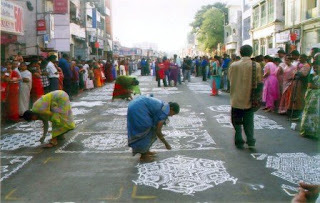 Kolam has it own cultural and humanity sense in it as well. Kolam is drawn by hand on the ground with rice powder, which helps not only is beautifying the home but also serves as food for ants and little birdies...!!! Kolams are essentially of 2 kinds, one is potti kolam/rangoli by connecting the dots and form images like this. This one only requires aesthetic sense. And colors could be added in this. Traditionally these colors were also from nature. Red from Henna/Marudani, green from leaves, yellow from Samandhi (Chrysanthemum) etc. 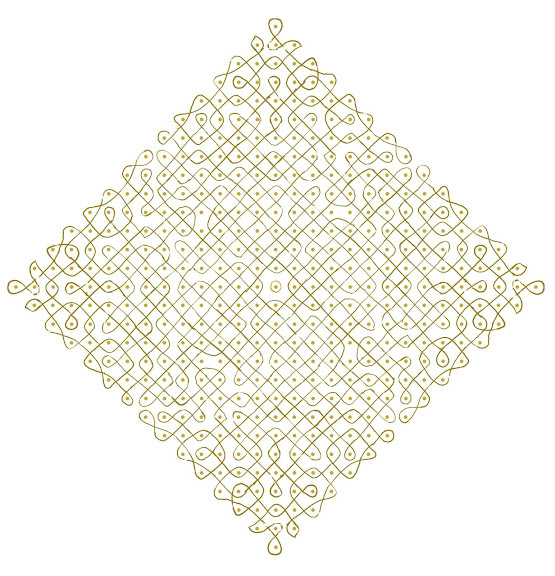 Another is my favorite – The suzhi kolam which is drawn by curvy, slender lines taken around the dots. This one is always been my favourite and I keep trying to develop new ones. This type needs brains along with aesthetic sense. This one is one of my trials. The speciality is that it is a single line kolam. The whole kolam is formed by a single line and it could be drawn without lifting the hand. Usually this is done in white only. I had gone there just as a spectator and indeed a photographer. Looking at me with a huge Nikon Camera (It’s a film camera not a digi. An SLR one. It’s really huge and with that I look like a journalist), thanks to my appearance the crowd easily let me in and made space for me to capture those moments in my frames in several angle. Then I thought my pics would be a lot better and I could capture the kolams so well from any of the high rise buildings on the sides. I got into one of the shops and asked permission to access their terrace. Again thanks to my appearance, I was immediately granted permission and went to the terrace. There was another office functioning in the first floor and I had to pass across the office to reach the balcony for my shot. Again, I was granted permission easily and I got my splendid pics of all the Kolams together in a single frame. Well, during those four days several other traditional talents and displayed that awe inspire us. Right from Thappattam to my favourite Oyilattam, to Kavadi, to Karagam and what not. 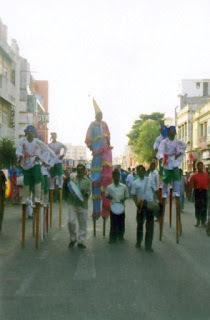 Also put up are several other Street Plays (Medai Nadagam). When I visited it was the performance of Kazhiattam (Kazhi – Log; Attam – Dance). Essentially a ‘stilt’ dance where the dancer ties up his feet on a log and dances with that. It was awesome. I couldn’t imagine myself balance on that stilt and trying to just stand and stabilize without falling and breaking my teeth, leave alone dancing. I wondered about their foot pain. The drum beat was great and was getting faster and faster (It was live orchestra like in any other traditional classical or folk art form) and their motion and movement became faster and fiercer. I tried this shot with a slower shutter speed and the result - I could get the essence of the speed of their movement. I bought that souvenir T-Shirt. Later in the evening was the Food Fest arranged by some college and a humorous street play. I watched it for some more time and returned back home still dazed with the dance performance. Your suzhi kolam is nice. When I was a young boy, i used to help my aunties during the Markazhi Maasa Kolams. The (journalist's !!) photographs are very good. The poet found a way to my blog..
Lovely explanation of the festivals. I particularly liked your elaborate explanation of the different kolams. 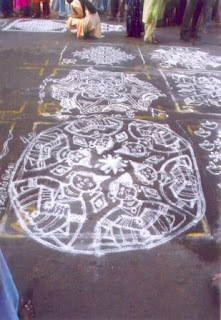 I was news to me to note that kolam is drawn with rice powder. I always thought that it was drawn with chalk powder. That was a great blog on Mylapore which is like a second home to me. No visit to Chennai is complete without a visit to Mylapore. 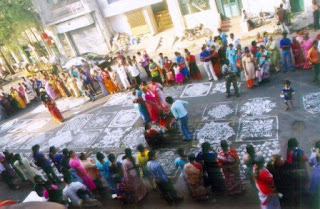 Yes the spectacular Kolam festival has become very popular these days & is extensively reported in the Mylapore Times. Yes Mylapore has its own unmatched,distinct cultural flavour. You get the best appalams in Mylapore. And Luz is the shoppers paradise. I was in Chennai a fortnight ago and went to the Kapaleeswarar Temple.Shall be putting up some pics of the temple shortly in my next blog post. Love your photos of kolam. Like you I especially like the curvy one suzhi kolam. India is full of culture and history. An amazing place to visit! And yes, the main reason for drawing kolam at our doorstep is to feed little insects and birds. So its always rice powder!!! Again I say, U r a 'Ulagam Sutrum Vaaliban'. Of late, Mylapore itseld has become a shopper's paradise. I'll come up with an extensive report on Kapaleeshwarar Koil soon. I did a month long project in that temple, during college. Btw, is it ok to call u Phivos or should I call u Nicolaides.??? Very interesting. This cultural events are always full of colors and people. The kolom snaps have come very nice. To draw them on the road with so many people looking at you work is real artistry. Would love to have you stop by on a regular basis!!! Just took a look at your blog. 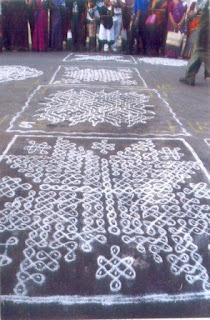 As I was also at the Mylapore festival and kolam contest, I read this post with particular interest. I was the only redhead there, so I would have been easy to spot. I liked the long vertical kolam shot of yours. My real name is Philip (Philipos in Greek) but they call me Phivos (the ancient Greek god of beuaty, Apollon)!! So it's okey to call me Phivos or Philip whatever is easier for you. Nicolaides is my surname and comes from Nicolas. NAMASTE!! Wud hav lykd it more wit light n mist...SLR, hmm...but thn u hav to travel from der to chennai...to c it, gud. street photography is somthin tht I havnt done much. Nice. I loved reading about my 'pettai' through your eyes, especially about the Mylapore Festival; I was there at its inception -when the festival was just the kolam competiton - and now how it has grown! P. S. I was with the neighbourhood paper for eleven years. A big hearty welcome to my Blog.. :) Thanks for droppping by and commenting.. :) Nice to meet a person who has grown side by side with the festival. 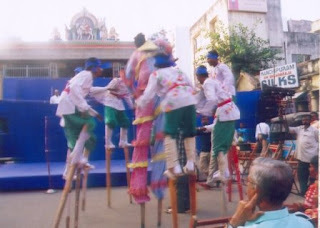 Mylapore Festival 2011. January 6 to 9, 2011.